How Much Can You Negotiate on Certified Pre-Owned Cars? If you would like to buy a new vehicle but are not interested in paying new vehicle prices, a certified pre-owned vehicle could be an excellent fit for you. Buying a certified pre-owned car is a lot like buying a new car, but with prices closer to what you would expect when purchasing a used car. Trained mechanics inspect certified pre-owned vehicles, which are resold by the manufacturer, with a warranty. When you are buying a certified pre-owned vehicle, you can trust that the car is in good working condition. Certified pre-owned vehicles are an excellent safe bet, which means they will generally cost more than a regular used car. If you’re using a pricing guide such as Kelley Blue Book, it will have a special pricing category called “certified.” Vehicles in this category will often cost on average $1,400 more than the same used car that isn’t pre-owned would cost. Every manufacturer that has a CPO program will offer you a different sort of warranty. Some will provide you with several years and a set number of miles, and others will focus on a time limit only. Be sure to ask about the fine print: Are you purchasing a warranty that covers everything on your vehicle bumper-to-bumper, or does your coverage only include problems with the powertrain? Does the time limit start once you sign the papers, or does it include the time the first buyer was driving the vehicle? Is there any remaining warranty that comes with the car that the original buyer did not use up? When you buy a certified pre-owned vehicle, you can be rest assured that everything on the inside is working correctly––but you should still inspect your own. Focus on the aesthetics: Are there scratches, dents, or stains inside or outside of the vehicle? Does it look like this vehicle was driven every day, or like something owned by a meticulous driver who only took it out on the road once a week or so? These things will be the realities of your everyday drive if you purchase the vehicle, so it’s essential that they are to your liking. But it’s also important to take note of these things because they will impact how much you should be willing to pay for the vehicle. Two identically priced pre-owned cars may, in reality, be different on the inside, so it’s important to pay attention. You should also take a look at the inspection report from the manufacturer to get a sense of how soon you will need to perform maintenance on your vehicle or replace critical parts, like the brake pads, which could have worn thin. The report should tell you every part of the vehicle that was inspected and the condition those parts were in. You should also ask to see the car’s vehicle history report and make sure it’s up to date. Many local dealerships’ websites will feature CPO cars under whatever that particular company has named their CPO program. In a car lot, CPO cars are usually in a prominent area away from other vehicles––make sure that the vehicle is legally covered by the manufacturer, not just labeled that way. 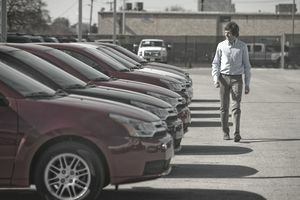 Once you find a car that you love, it will be tough to drive a hard bargain; many dealers will probably try to explain to you that you are getting a great value on the car––which you are––but you can still negotiate over the price just like you would for any other vehicle you are looking to purchase. Remain calm and know the vehicle’s value. It helps to have a few makes and models in mind before you go to the lot––look up the listed certified value in a few indexes, and be prepared to calmly state the price you are willing to pay. If you find yourself with a bad deal and a salesperson who won’t budge, it’s better to walk away; there are many certified pre-owned cars around the country, and you will find the perfect one in your price range soon enough.